via Scientist: “The Murdoch Media Empire Has Cost Humanity Perhaps One or Two Decades in Battle Against Climate Change.”. Rupert Murdoch has said he cannot be held responsible for the scandal at the News of the World, saying he was let down by “people I trusted”. The News Corporation boss said he was not aware of the extent of phone hacking there and had “clearly” been misled by some of his staff. His son, James, apologised to victims, saying hacking was “inexcusable”. The hearing was the first time Rupert Murdoch has faced direct scrutiny by MPs in his 40-year UK media career. “Murdoch eats humble pie,” is how the Daily Telegraph and the Daily Express sum up the News Corp chief’s appearance before the Culture select committee. Rupert Murdoch’s opening that it was the most “humble” day of his life also gives the headlines for the Financial Times, the Sun and the Guardian. Tuesday’s events at the Wilson Room in Portcullis House make the front page of every single paper. News Corporation chiefs Rupert and James Murdoch and former executive Rebekah Brooks will be quizzed by MPs later about the phone-hacking scandal. The Murdochs agreed to appear before the Commons media committee after it issued a summons for them. The MPs said they had questions over evidence given by Mrs Brooks and Andy Coulson – both ex-News of the World (NoW) editors – at a hearing in 2003. A former News of the World journalist who made phone-hacking allegations against the paper has been found dead at his home in Watford. Mr Hoare had told the New York Times hacking was far more extensive than the paper acknowledged when police first investigated hacking claims. Sean Hoare also told the BBC’s Panorama phone hacking was “endemic” at the NoW. When bloodless coups come about in dictatorships, often it’s when the head of government is away on a foreign visit. But democracies bring their own dangers for absent political leaders. NEW YORK, July 15 (Reuters) – Les Hinton, the top executive of Rupert Murdoch’s Dow Jones & Co, resigned on Friday after becoming a target of criticism for the phone-hacking scandal that occurred when he oversaw News Corp’s British newspapers. Hinton stepped down as the British phone hacking scandal surrounding News Corp began to spread to the United States. He is the highest ranking executive yet to resign over a crisis that closed down the News of the World tabloid and scotched News Corp’s $12 billion attempt to buy out BSkyB. I have watched with sorrow from New York as the News of the World story has unfolded,” Hinton wrote in a memo to staff after resigning as chief executive of Dow Jones and publisher of The Wall Street Journal. “That I was ignorant of what apparently happened is irrelevant and in the circumstances I feel it is proper for me to resign from News Corp, and apologize to those hurt by the actions of the News of the World,” he added. At the Wall Street Journal, news of Hinton’s departure was greeted by gasps and a stunned silence, despite much speculation in both London and New York that he could be toppled by transgressions that occurred on his watch. Hinton’s resignation came on the same day that another top Murdoch confidante, Rebekah Brooks, stepped down as chief of News International, which is responsible for all Murdoch’s British papers. Brooks worked under Hinton when she was News of the World’s editor and he ran News International. A “humbled and very shaken” Rupert Murdoch has apologised to the family of Milly Dowler in a meeting in London. The chairman of News Corporation requested the meeting after it emerged that the murdered schoolgirl’s mobile phone was hacked by the News of the World newspaper in 2002. Rupert Murdoch has made a “full and humble” apology to the family of the murdered schoolgirl Milly Dowler at a private meeting held at a central London hotel. The global head of News Corporation “held his head in his hands” and repeatedly told the family he was “very, very sorry”, according to the Dowlers’ lawyer Mark Lewis. 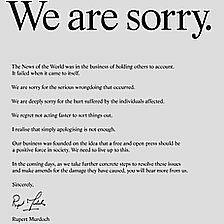 National newspapers are running a full-page advert with a signed apology from Rupert Murdoch over “serious wrongdoing” by the News of the World. Rebekah Brooks, a former editor of the paper, and senior News Corporation executive Les Hinton both resigned on Friday over the phone-hacking scandal. The printed apology expresses regret for not acting faster “to sort things out”. “I realise that simply apologising is not enough. Our business was founded on the idea that a free and open press should be a positive force in society. We need to live up to this. “In the coming days, as we take further concrete steps to resolve these issues and make amends for the damage they have caused, you will hear more from us”, says the statement, signed “sincerely, Rupert Murdoch”. The FBI is investigating reports that Rupert Murdoch’s News Corporation sought to hack the phones of victims of the 9/11 attacks. The criminal probe follows calls from a growing number of senators and a senior Republican for an investigation. In an interview with the Wall Street Journal, Mr Murdoch defended the company’s handling of the crisis. 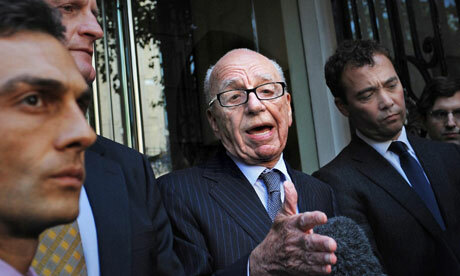 Meanwhile, Mr Murdoch and his son James have agreed to answer UK MPs’ questions on the hacking scandal next week. DISCLAIMER: The Suzie-Q blog is owned, authorized, and operated by Suzie-Q. Comments or Guest articles posted by individuals on this blog are the sole responsibility of the author and do not necessarily reflect the opinions of Suzie-Q. Any endorsement of any comments or guest articles posted herein is neither implied nor suggested. Differing opinions are welcome, personal attacks will not be tolerated and those engaging in personal attacks will be banned. We will delete those comments that include the following actions: • are abusive, off-topic, use excessive foul language • contain racist, sexist, homophobic and other slurs • are solicitations and/or advertising for personal blogs and websites • are posted with the explicit intention of provoking other commenters on this blog.